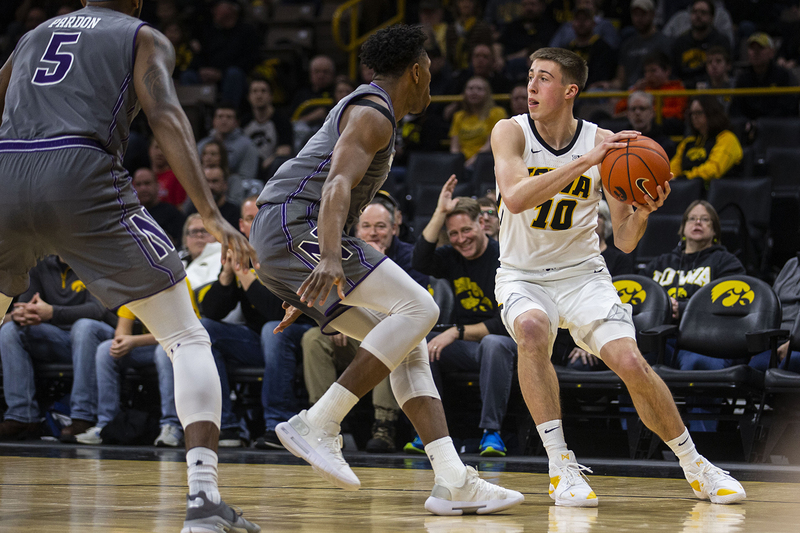 Iowa guard Joe Wieskamp looks to pass the ball during the Iowa/Northwestern men's basketball game at Carver-Hawkeye Arena on Sunday, February 10, 2019. The Hawkeyes defeated the Wildcats, 80-79. Multiple players have carried the load for Iowa this season. Two DI staffers debate who the Hawkeyes’ best pure scorer is. If you look at the current stat sheet, it shows Tyler Cook and Luka Garza sitting on top as Iowa’s top scorers, but their efficiency can be questionable at times. That brings me to the next two top scorers in the lineup. Most people would say that Joe Wieskamp or Jordan Bohannon is the top scorer at Iowa right now. This is not the case. With the amount of time they spend on the court, they should have more points. They have been given the opportunity on numerous occasions and while they have certainly had successes, they seem to go on cold streaks quite often. That is why the conclusion of who the best pure scorer for the Hawkeyes is Isaiah Moss. The way head coach Fran McCaffery plays Moss shows he is one of the few players McCaffery trusts to go in and score points when Iowa is in a pinch. What also stands outs about him is his playmaking abilities and that he can knock down a shot from any part of the court. He moves around a lot more than the rest of the Hawkeyes to look for shots, and when the time comes, he makes them. It is hard to pick when each of the five players mentioned have been decent all season. After all, Iowa wouldn’t be where it is without Bohannon’s clutch gene, Wieskamp’s shooting, or Cook and Garza’s ability to battle in the paint. But Moss has also found ways to carry the team in certain games. It seems like he started the year hot and has no intentions of slowing down.